How to fish for Sardine? Sardines make good bait to catch larger fish, such as sailfish, wahoo, king mackerel, grouper and snapper. One of the quickest and simplest ways for the recreational angler to fish for sardines is with a cast net. With a properly sized net, the correct casting technique and a little good fortune spotting sardines schools, you can quickly catch enough to place in your live well for your entire fishing trip. Of course, if you don’t catch anything with your sardines, you can always eat them instead. Select a net that you can handle easily. 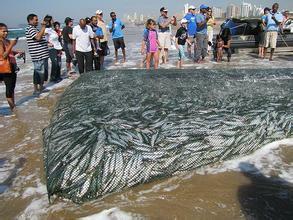 Typically, cast nets used for sardines range from 6 to 8 feet in radius. Sardines average from 6 to 12 inches long. Choose a net that has a mesh size between 1/2 and 5/8 inch wide. Observe the seawater for signs that sardines are schooled near the surface. Watch for spray and movement over the surface of the water and for sea birds, fish or dolphins feeding. Secure the hand line loop to your wrist to avoid losing the net when you cast. Grasp the horn collar of the net and allow the weights to drop to the deck, pulling the braille lines through the horn to open the net. Gather up the net in one hand. Grasp the leading edge of the lead line at the bottom of the net with the other. Observe the sardines and move your boat as close to the school as possible. Cast your net over the sardines by rotating your body and throwing the lead line outward to form an umbrella shape with the net, releasing the gathered net in the other hand at the same time. Allow the net to drop to the end of the hand line to trap as many sardines as possible under the net. Pull up on the hand line to pull the braille lines through the horn and close the bottom of the net around the trapped sardines. Pull the net up onto the boat deck. Hold the net over a 5-gallon bucket. Pull the horn collar up to open the net and allow any sardines within to drop into the bucket. Remove any unwanted fish. Pour the remaining sardines into your live well. Repeat this process until you have sufficient sardines for your fishing trip.